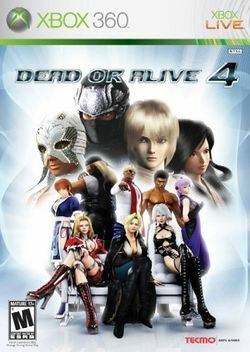 The premier fighting title for the Xbox has made its way to the next generation with Dead or Alive 4. Featuring seventeen returning favorites and four new characters, larger move sets and arenas, and of course, online multiplayer, this is one that should have fighting fans busy for a long time. The critically and commercially acclaimed Dead or Alive series once again rises to new levels in Dead or Alive 4 with more speed, power, new characters, never before seen moves, beautifully detailed interactive levels, stunning costumes, the ever-lovely DOA ladies, and raw head-to-head heart pumping excitement all while pioneering a new generation of gaming for the fighting game era. Advanced countering system bring the fastest fighting action ever made for a home console! Experience the DOA online world: form clans, play simultaneously in large groups, play in tournaments and chill out in the interactive DOA4 lobbies! New characters include Kokoro, La Mariposa and Eliot, plus, the return of DOA3 favorites, Christie and Brad Wong! Master level game design and unbelievably realistic graphics from the legendary development group, Team NINJA! All new DOA environments interact with your deadly moves! New revealing secrets from the dramatic and competitive world of DOA! This page was last edited on 1 August 2011, at 04:38. This page has been accessed 13,259 times.